Since 1975, Baker's has been the industry leader in the basement waterproofing and foundation repair field. We put customer service as our # 1 focus. Because of this, we are constantly seeking talented individuals that have proven themselves to be self-starters, disciplined, and reliable. We value and promote individuals who perform with the following traits: Integrity, Excellence, Innovation, Outreach, & Unity, and will not accept anything less. At Baker's, your performance is tied to your income. If you believe you are a person with these traits, and are interested in joining our team, please select one of the options below. We are always looking for candidates with Construction, Carpentry, Sales, Administrative, and Customer Service backgrounds. 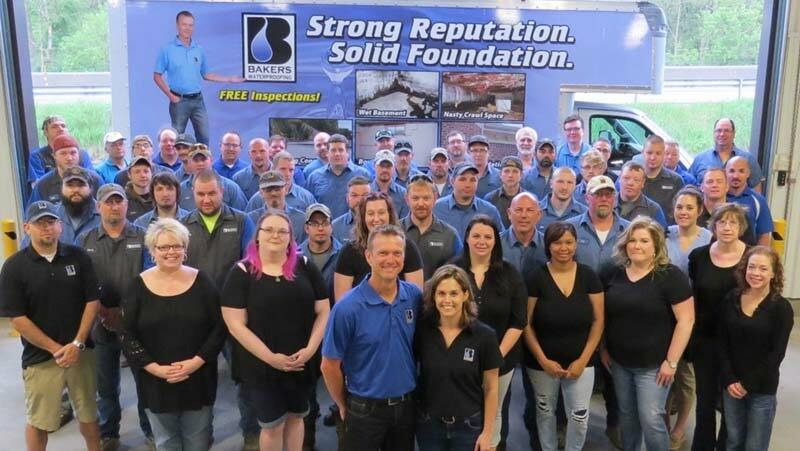 Baker's Waterproofing and Foundation Repair has been locally owned and operated since 1975. Today we are one of the largest basements waterproofing and foundation repair contractors in South Western Pennsylvania. Do you have strong mechanical and troubleshooting skills? Do you enjoy work when you know you have actually helped your customer? Apply as a Service Technician and see how your skills and work ethic can earn you a good living. Are you considered a Jack of all Trades who can help others when in need? Are you looking for career stability and control over your own success? Baker's Waterproofing Co., a regional leader in the foundation repair industry, is looking for a Construction Crew Member. Baker's Waterproofing Co., a growing, regional leader in the foundation repair industry, is looking for a Foreman in Training. Don't see a position for you? Send us your resume regardless!